Gabonese President Omar Bongo during the conference of the Non-Aligned Movement in Lima. Peru, 1975. As Gabon begins a month of mourning and condolences pour in for President Omar Bongo, the world's longest serving President, who died on Monday at 73 in his 42nd year in power, it's worth remembering that Bongo was precisely the kind of leader Gabon, and Africa, could have done without. Gabon has a tiny population (1.4 million) and vast oil reserves, and after four decades of exporting hundreds of billions of dollars of crude, the biggest testament to the corruption and ineptitude of Bongo's rule is that he somehow contrived not to turn his country into an African Kuwait. The investigation, carried out by a French magistrate responding to a lawsuit filed by the anticorruption watchdog Transparency International, has established that the Bongo family owns at least 33 luxury properties in France worth a total of $190 million, including a Paris villa bought in 2007 for $26 million and a Paris mansion bought the same year for a further $25 million. That last pile was officially bought by Bongo's two children, Omar Denis and Yacine Queenie, who were 13 and 16 at the time. The family, through Bongo, consistently denied corruption, although not that they owned the properties. Bongo was far from the only postcolonial African head of state to take his country's riches as a personal reward for the burdens of office. The French-property portfolios of two others  Denis Sassou-Nguesso of Congo Brazzaville and Teodoro Obiang of Equatorial Guinea  are also under investigation, and the French have made inquiries into the assets of Jose Eduardo dos Santos of Angola and Blaise Compaoré of Burkina Faso. Like Bongo, all have denied any wrongdoing. 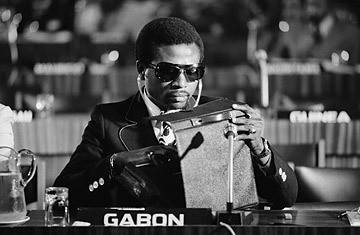 But Bongo was one of the greediest and, coming to power at 31 in 1967, just seven years after Gabon's independence, one of the first. As such, he set and maintained the catastrophically low standard for African leadership that would ensure that a continent bursting with natural resources would remain the poorest and most war-ravaged place on earth for the ensuing four decades. Bongo set the paradigm for Africa in other ways too. What money he did spend on Gabon went on white-elephant prestige construction projects  a raft of new government buildings and a $2 billion transnational railway  which, when oil prices dipped, were funded by debt that spiraled out of control and threatened to bankrupt the country. And in politics, Bongo fixed elections for himself and bought off political opposition with money or power  despite its small size, Gabon has more than 40 Cabinet Ministers  or worse. Several opposition members were killed in the 1970s. In 1990, the mysterious death of opposition leader Joseph Redjambe sparked riots. And late last year, two journalists and three civil-society leaders investigating Bongo's finances were arrested. In February, the U.S. State Department classified the human-rights record of Bongo's Gabon as "poor" and listed such problems as "limited ability of citizens to change their government; use of excessive force, including torture ... arbitrary arrest and detention ... restrictions on freedom of speech, press, association, and movement ... widespread government corruption." There is hope that Bongo's death may help set a new pattern for Africa, opening the way for a new era of reform and shared prosperity. Across the continent, the old "Big Men" dinosaurs are dying off. Gone are Idi Amin of Uganda, Mobutu Sese Seko of Zaïre, Hastings Banda of Malawi and Charles Taylor of Liberia. Those that remain are precariously long in the tooth: Libya's Muammar Gaddafi has been in power for 39 years, while Dos Santos of Angola and Obiang of Equatorial Guinea have ruled for 29 and Zimbabwe's Robert Mugabe for 28. Sadly, for Gabon, a fresh start is far from assured. In another move also widely imitated across Africa, Bongo tried to ensure that his family's hold on power would survive him. His daughter Pascaline was his chief of staff; his son Ali is Defense Minister. They have consistently denied all allegations of corruption. Both are believed to want to succeed their father. See pictures of the Pope in Africa.